There are only two new players of interest to Canadians in this year’s Hall of Fame ballot. Matt Stairs (from New Brunswick) and Vlad Guerrero (long time Expos player). I’ve previously made cases for all these guys (and explained why they should be on the list of players of interest to Canadians) except Jeff Kent. And I think every year I end up with no room for McGriff and he gets dropped off my ballot. But Raines, Clemens, Edgar and Walker are no brainers. Matt Stairs – already covered him in my Red Sox post. Love the guy, but no. 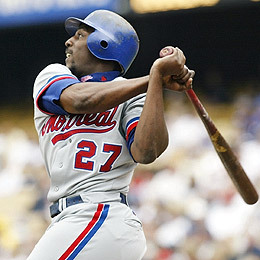 Vladimir Guerrero – The raw back of baseball card numbers: .318 batting average, 449 home runs, 181 steals. We've evolved to where we determine the worthiness of a player on more than just these numbers, but it is worth mentioning that NOBODY in the history of baseball has him beat on all three. Quick: What do no doubt Hall of Famers, Reggie Jackson, Yaz, George Brett, and Ken Griffey have in common? They all have a career OPS (and OPS+ adjusted for the eras they played in) lower than Guerrero's. He had a stretch of 10 years where he AVERAGED an OPS+ of 151. There were three guys who bested that in the NL last year. It's not a question of whether he should get in or not. It's a question of whether or not it will be an insult to not have him in as a first ballot Hall of Famer!